Speckle is the shimmering effect that you’ve seen every time you use a laser pointer. From a technical perspective, speckle is an interference pattern that occurs when coherent light is scattered off an optically rough surface, such as a screen. 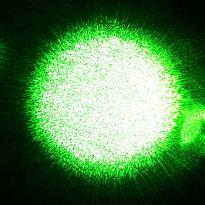 Since laser beams consist of coherent light, they will usually exhibit speckle. It is observed as visible ‘noise’ on a uniform area of the scene and decreases the perceived contrast of the pictures; is most visible on uniform, bright scene elements. Speckle is more visible when the viewer moves their head back and forth. While speckle is inherent in any laser light source, researchers have developed very effective means of virtually eliminating visible speckle in state-of-the-art laser illuminated projector systems. But due to the optical characteristics of the speckle phenomenon, it is difficult to make accurate and repeatable measurements. For example, the measured results depend on type of instrumentation used, exposure time, measurement distance, screen surface characteristics and many other factors that -until now- have not been defined to assure consistent results. In digital cinema, screen luminance levels, chromaticity and uniformity are already tightly specified with reference values and tolerances for projector operators, in order to preserve the high image quality and creative intent of the filmmaker. At LIPA, we believe that the degree of speckle removal should also be evaluated in order to ensure consistently high quality digital cinema movies. LIPA’s Speckle Metrology Working Group (SMWG) has been working for the past two years on researching and documenting a preferred technique for speckle measurement. The goal was to create a test protocol that is accurate, repeatable and easy to use. The result is the Recommended Practice: Measurement of Speckle in Laboratory Conditions. This document is now available at no cost a the link below. LIPA requests your registration simply for purposes of gauging interest. Note that this is Version 1 of the Reccomended Practice. As industry experts begin to use the test procedure, we expect to find further enhancement or clarifications to the document. Comments and feedback are encouraged. Please contact the SMWG by email at speckle@https://www.lipainfo.org.